Governor Greitens (R) says there will not be abortion sanctuary cities in Missouri while he’s governor. He addressed a large crowd today at an anti-abortion rally in the state capitol. Last month, St. Louis passed a bill to become an abortion sanctuary city by banning employers and landlords from discriminating against women who are pregnant, use contraceptives or have an abortion. Pro-choice supporters say women’s rights are human rights. Some state legislators have filed bills aimed at blocking the changes to St. Louis city’s ordinance. Greitens says his proposed budget has more money for alternatives to abortion clinics than at any time in Missouri history. “We have to do everything in our power to stand up for, protect and defend the lives of the innocent and unborn,” said Greitens. 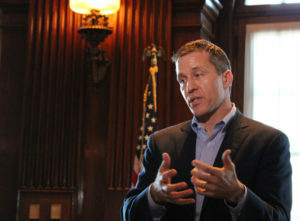 In his spending plan that begins in July, Greitens has proposed $6 million in funding for alternatives to abortion agencies.